Bon appétit! I was invited to a home-cooked meal by my friend, the graphic designer, and his wife. I also got some great digital camera tips and essential photography advice to improve my photos in no time. But did I pay attention this time? I did, because there was a lot of dark chocolate. Their lovely son introduced me to Glippie, his cat. She’s a very beautiful little kitty and I believe she would like to meet Mr. Bowie sometime. PS: The meal was delicious! Thank you my friends. Ooh, big boys toys! Hi Glippie, what a cutie. I don’t think she would share her food with Mr Bowie. She is keeping her food well protected. Oh, well, that changes everything. A kitty who shares chocolate is utterly adorable. Glippie has a darling little “girlie” face……perhaps she and Mr. Bowie would make beautiful music together? Dark chocolate ALWAYS makes for a spectacular evening – I’d pay attention to that too! There’s always dark chocolate in our houses. That’s rule #1 if we get-together! She is very pretty and I bet Bowie would think so too…….. He is so attractive, and could choose from many lady cats with a face like his. Have you considered making his pictures into a calendar? Nice lady cats all over would want one. I know MaChatte would want one, cos she has seen his pictures. Perhaps next time they will extend an invitation to Mr. Bowie as well! Glippie has a lovely face…I’m sure Mr. Bowie would like her! I was first drawn to the camera…ahhhh… and then noticed Glippie’s gorgeous eyes!! Wow! Glippie and Bowie sitting in a tree, la la la…..Camera tips and a meal, you’ve been very spoilt this weekend….just like our cats LOL. 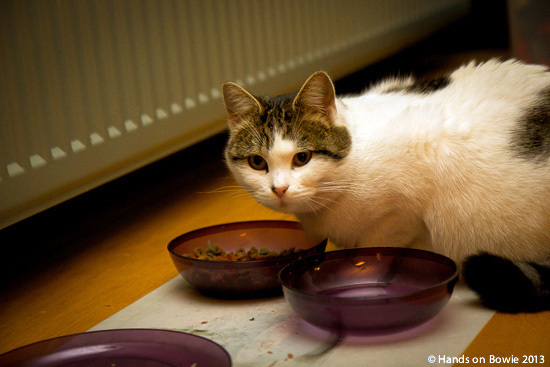 Pretty Miss Glippie, but we think she’s saying everything in her bowl is all hers. I love cat (and dog) names. Glippie is such a cute name and suits her well. Of course, I love Mr. Bowie’s name too. It makes me smile every time. A great home-cooked meal and lots of chocolate. Sounds like the perfect evening. Plus, there’s a kitty. But what are you gonna do with Mr. Bowie? He’s turning into quite the eligible bachelor! 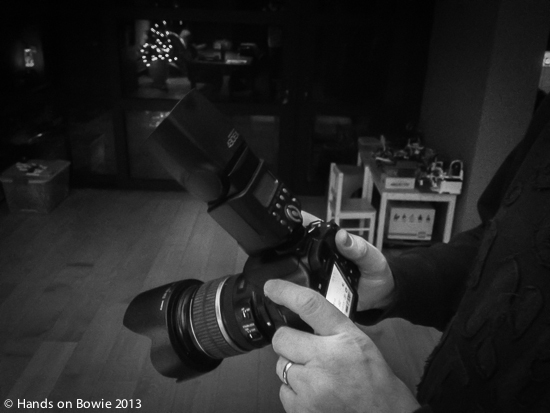 Bowie is just being himself……and what a great story he makes! thanks!